This is the state-of-the-art, international handbook for a field of inquiry that is still emergent and yet occupies a central position in contemporary management and organization theory. 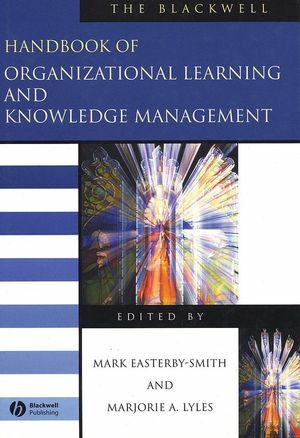 Marjorie Lyles at the University of Indiana and Mark Easterby-Smith at Lancaster University, UK, draw together analyses and critical commentary from the leading experts on organizational learning and knowledge management around the world. Links are made to existing bodies of theory in the root disciplines of economics, psychology and social theory, while the challenging implications for research and future paths of inquiry are outlined and discussed. The definitive up-to-date guide to the field. Original contributions by the leading scholars of Organizational Learning and Knowledge Management world-wide. Handbook shows links between 'knowledge' and 'learning' literatures. Indicates paths for future research and inquiry. 'Must Have' reference source for all scholars in this field. Mark Easterby-Smith is Associate Dean and Director of the Graduate Management School at Lancaster University. He was founder of the international journal Management Learning and is internationally renowned for his published work on organizational learning and management research methods. Currently he is Vice-Chair of the British Academy of Management. Marjorie A. Lyles is Professor of International Strategic Management and the Kimball Faculty Fellow at the Indiana University Kelley School of Business, USA. She has worked in Europe, China, and the USA, and published seminal articles in the Strategic Management Journal and Journal of Management Studies on strategy and learning. She is widely recognized for her contribution to the field. Introduction: Watersheds Of Organizational Learning And Knowledge Management: Mark Easterby-Smith (Lancaster University)and Marjorie A. Lyles (Indiana University). 1. Psychological Perspectives Underlying Theories of Organizational Learning: Robert Defillippi (Suffolk University) and Suzyn Ornstein (Suffolk University). 2. Social Learning Theory: Learning As Participation In Social Processes: Bente Elkjaer (Danish University of Education). 3. The Role of Information and Communication Technologies In Knowledge Management Initiatives: Niall Hayes (Lancaster University) and Geoff Walsham (University of Cambridge). 4. Knowledge Management: What Can Organizational Economics Contribute? Nicolai J. Foss (Copenhagen Business School) and Volker Mahnke (Copenhagen Business School). 5. Knowledge Management: The Information Technology Dimension: Maryam Alavi (Emory University) and Amrit Tiwana (Emory University). Part II: Learning And Knowledge In Organizations:. 6. Organizational Learning And Knowledge Management: Toward An Integrative Framework: Dusya Vera (University of Western Ontario) and Mary Crossan (University of Western Ontario). 7. Organizations As Learning Portfolios: Anthony J. Dibella (East Greenwich and Worcester Polytechnic Institute). 8. Framework For The Development of Communities Of Practice In A Corporate Environment: Josh Plaskoff (Eli Lilly and Company). 9. Understanding Outcomes Of Organizational Learning Interventions: Amy C. Edmondson (Harvard Business School) and Anita Williams Woolley (Harvard Business School). 10. The Impact Of Intercultural Communication On Global Organizational Learning: Sully Taylor (Portland State University), Joyce S. Osland (Portland State University) and Dr Robert B. Pamplin. 11. Knowledge Seeking FDI And Learning Across Borders: Shige Makino (Chinese University of Hong Kong) and Andrew C. Inkpen (American Graduate School of International Management). 12. Beyond Alliances: Towards A Meta-Theory Of Collaborative Learning: Jane E. Salk (University of Texas at Dallas)and Bernard L. Simonin (Tufts University). 13. Knowledge Management And Competitive Advantage: Bala Chakravarthy (IMD), Sue McEvily (University of Pittsburgh), Yves Doz (INSEAD) and Devaki Rau (Northern Illinois University). 14. Absorptive Capacity: Antecedents, Models, And Outcomes: Frans A. J. Van Den Bosch (Erasmus University Rotterdam), Raymond Van Wijk (Erasmus University Rotterdam), and Henk W. Volberda (Erasmus University Rotterdam),. 15. Narrative Knowledge In Action: Adaptive Abduction As A Mechanism For Knowledge Creation And Exchange In Organizations: Caroline A. Bartel (New York University) and Raghu Garud (New York University). Part III: Organizational Knowledge And KM:. 16. Dominant Logic, Knowledge Creation, And Managerial Choice: Richard A. Bettis (University of North Carolina at Chapel Hill) and Sze-Sze Wong (Duke University). 17. Innovation And Knowledge Management: Scanning, Sourcing, And Integration: Paul Almeida (Georgetown University), Anaupama Phene (University of Utah), David Eccles & Rob Grant (Georgetown University). 18. Knowledge Sharing And The Communal Resource: Georg Von Krogh (University of St Gallen). 19. Organizational Forgetting: Pablo Martin De Holan (University of Alberta) and Faculté Saint-Jean. 20. Do We Really Understand Tacit Knowledge? Haridimos Tsoukas. 21. Knowledge And Networks: Raymond Van Wijk (Erasmus University Rotterdam), Frans A. J. Van Den Bosch (Erasmus University Rotterdam), Henk W. Volberda (Erasmus University Rotterdam). 22. The Political Economy Of Knowledge Markets In Organizations: Rob Cross (University of Virginia) and Laurence Prusak (IBM Institute for Knowledge-based Organizations). 23. Barriers To Creating Knowledge: Mikelle A. Calhoun (New York University) and William H. Starbuck (New York University). Part IV: Problematizing OL And Knowledge:. 24. Discourses of Knowledge Management And The Learning Organization: Their Production And Consumption: Harry Scarbrough (University of Warwick). 25. Stickiness: Conceptualizing, Measuring, And Predicting Difficulties To Transfer Knowledge Within Organizations: Gabriel Szulanski (University of Pennsylvania) & Rossella Cappetta (Bocconi University). 26. Social Identity And Organizational Learning: John Child (University of Birmingham) and Suzana Rodrigues (University of Birmingham). 27. Emotionalizing Organizational Learning: Stephen Fineman (University of Bath). 28. Learning From Organizational Experience: John S. Carroll (MIT Sloan School of Management), Jenny W. Rudolph (Boston College) and Sachi Hatakenaka (MIT Sloan School of Management). 29. Deliberate Learning And The Evolution Of Dynamic Capabilities: Maurizio Zollo (INSEAD)and Sidney G. Winter (University of Pennsylvania). 30. Semantic Learning As Change Enabler: Relating Organizational Identity & Organizational Learning: Kevin G. Corley (Penn State University) & Dennis A. Gioia (Penn State University). 31. Organizational Learning And Knowledge Management: Agendas For Future Research: Marjorie A. Lyles (Indiana University) and Mark Easterby-Smith (Lancaster University).